Adding an Operator (OP'd user) to the server is very easy and is a very quick process at NetherBox. An Operator, also referred to as an OP'd user, will have access to all commands on the server, and will act as a Server Administrator. Remember, adding an OP user to someone you do not trust can be very dangerous! Remember to only give this power to users you absolutely have the utmost trust for. 1. 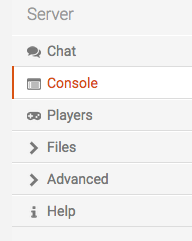 Navigate to your server console using the "Console" button on the left hand side of your control panel. 3. After you have entered this command, the user you have granted the status to should now have the Operator status on the server. If you have any questions or face any issues/difficulties throughout the process, please contact our support team by clicking here and we will be able to assist you in getting a player granted with the OP status.